SampleRadar doesn't make New Year's resolutions, but if it did, it would be to carry on doing exactly what it did in 2009: giving you high-quality, royalty-free loops, hits and multisamples for nothing. This week, with the weather outside (in the UK at least) being frightful (there's an idea for a song in there somewhere…) we've decided to turn up the temperature and ease down the stress levels by bringing you a collection of chilled-out Balearic bliss samples. This is the sound of an Ibizan sunrise - just what you need to see off the chills when your central heating fails. The samples are split into four folders, each of which contains a construction kit of samples at a defined tempo (100, 105, 125 and 135bpm). As well as loops, each kit also contains hits and multisamples. All the hits and kits are supplied as 24-bit WAV files so can be imported directly into your DAW or sampler of choice. Because they're royalty-free, you're welcome to use the samples in your music in any way you like - all we ask is that you don't re-distribute them. 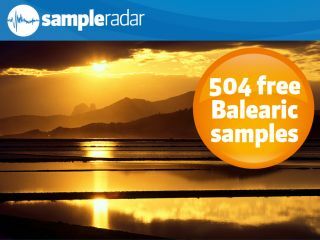 The Balearic bliss samples are supplied in a zip file, so you'll need to extract them before you can see them. Enjoy!